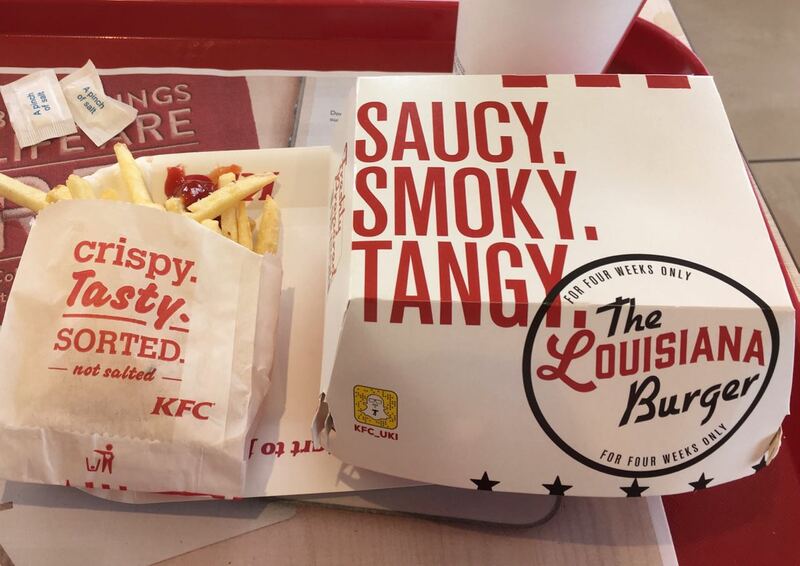 I first heard about this new KFC burger from an advert on facebook that made me laugh. It was a tongue in cheek pieces about “clean eating” (ice cube relish anyone? ), and it is worth a google if you like that sort of thing. I wasn’t sure if the new KFC Dirty Louisiana Burger would be available in the UK, adverts online can sometimes be specific to the USA, but our local branch of KFC had a big sign up advertising the new burger, so we decided to go in and give it the taste test. Now to say I had been sold on an advert becomes more significant when you hear that at the point of ordering I had no idea what I was actually ordering. Yes I knew it was a big burger, and if boiled spiralized chicken was considered “clean” then this was at the other end of the scale. The burger came in a nicely themed box and was wrapped in paper inside that too. 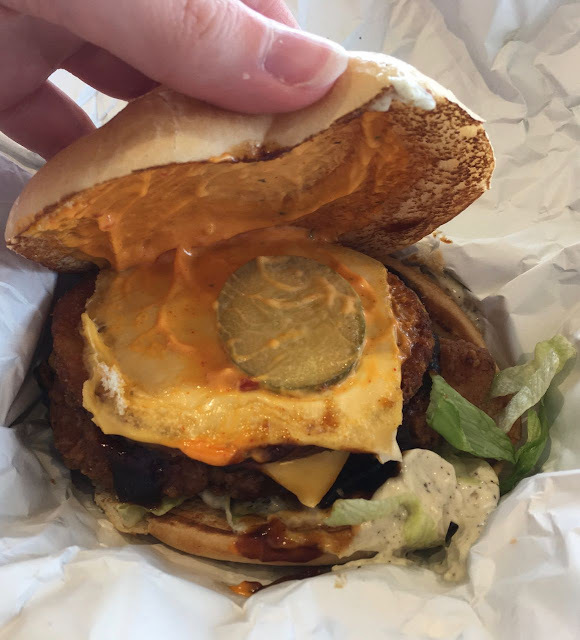 I opened up the box and found a burger with a large piece of chicken, two pieces of cheese, a hash brown, salad, gherkins, and most importantly lots of sauce, and different sauces at that. It soon dawned on me that the dirty part may well refer to the state of your hands after eating it! All of these goodies were packed into a toasted bun. I found this to be a bit of a flavour sensation. As there was several different sauces it meant that every bite tasted different. There was rich barbecue sauce, a cheese based sauce and a cooler black pepper mayonnaise. The mix of textures was spot on too, with the gherkin slices holding their crispy texture, the salad and the soft hash brown. 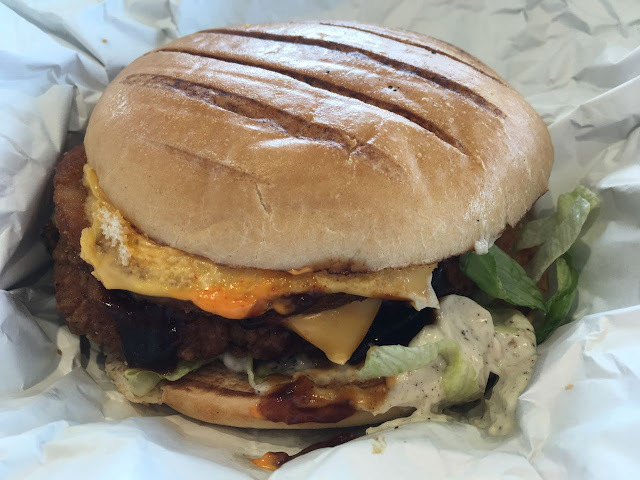 As I was eating I noted that my mouth was heating up a little and realised that somewhere mixed in was also some chilli heat, this burger really does have everything. As predicted my hands were dripping in spilled sauce and those little clean up wipes they give just didn’t seem big enough! This might be a bit of a novelty burger, but it certainly works, who would have thought having all the sauces could produce such a fantastic mix of flavours. The only problem is that The Dirty Louisiana Burger is only available for 4 weeks, so get in quick if you want to give it a try.